One weekend and two voices to be reckoned with performed in Minneapolis. Here are reviews. Jennifer Hudson is a big Oscar-winning, Grammy-winning, commercial-starring celebrity. But seeing her in concert Saturday at the PACER Center benefit at the Minneapolis Convention Center reminded music fans what “American Idol” – the show that launched her – is all about: Great voices in search of first-rate songs. J Hud, 36, is indeed a great voice. A gospel-reared screamer, she raises the roof higher than Prince and Little Richard combined. And hers is not a shrill scream. It’s rich and throaty and over the top. Moreover, her voice is deeply soulful in all its registers. The first half of her 75-minute performance reminded us that J Hud, more a famous star than a hit-making singer, is still looking for great material. Her tunes lacked memorable melodies; they were merely modern R&B love stories with repetitive choruses. Hudson did have some great songs in her set but they were covers. Her treatment of Leonard Cohen’s “Hallelujah” was as gospelly and spirit-raising as you’ll ever hear. Ditto her rendition of Prince’s “Purple Rain.” Before it, she talked about how she couldn’t come to Minneapolis without honoring Prince, her second biggest idol after Whitney Houston. At least, she's honest. She didn’t pander to the locals until her disco party song “It’s Your World” (with a little of Mark Ronson/Bruno Mars’ “Uptown Funk” mixed in) when she climbed into the audience and danced with fans for 15 minutes or so. 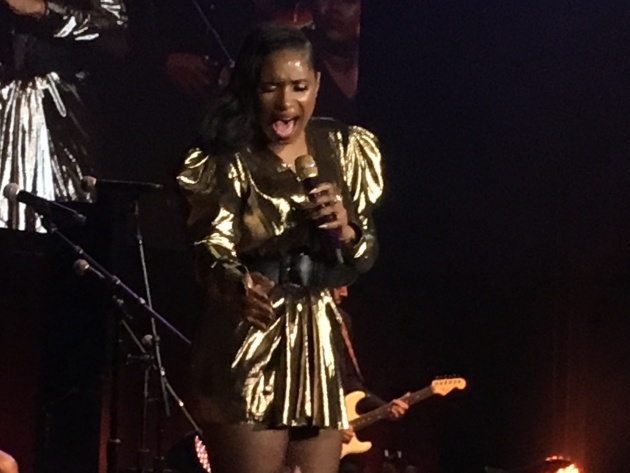 Fun, fun, unadulterated fun as J Hud got down with enthusiastic dancers and reached out to concertgoers in wheelchairs (PACER helps children and young adults with disabilities). The musical highlight might have been provided by Hudson’s three backup singers – George Huff, Siobhan and Patrice Covington, the first two "Idol" alums, the latter from "The Color Purple" Broadway cast with Hudson – as they sang “One Night Only” and “My Favorite Things” with understated jazzy elan. Hudson closed the evening by saying “without this song, I wouldn’t be here.” Sitting on a stool, she started singing a cappella her “Dreamgirls” smash “And I’m Telling You I’m Not Going.” She eventually cut loose with the most impassioned declaration of determination – eventually continuing to sing for a two full minutes after she exited the stage. 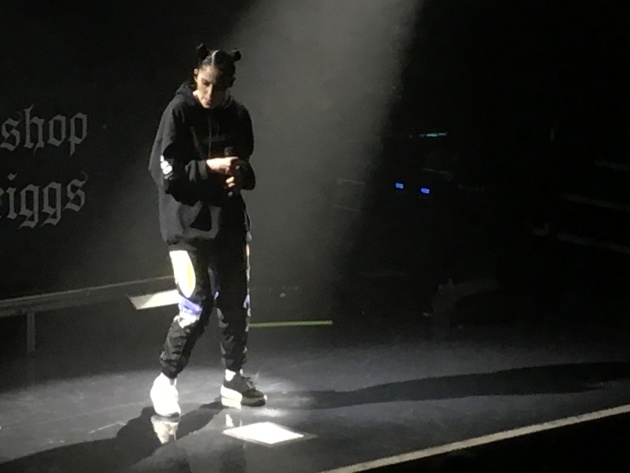 There’s a big buzz for British-born, Los Angeles-based pop-rock singer Bishop Briggs, who has been embraced by local radio station Go 96.3 FM. Hence, First Avenue was packed on Friday night to hear the rising 25-year-old. Sporting her signature tight-knit double buns hairdo, Briggs, who was born Sarah McLaughlin (a name similar to an established pop star’s), showed a natural hip-hop presence, an irresistibly exuberant manner and a consistently compelling voice with both pop-rock and soul instincts. Like an unpoetic Lorde or unbubblegum-y Katy Perry, Briggs sings emotional songs about relationships that rely on choruses repeated over and over. The rabid crowd loved it, especially radio favorites like “River” and “Wild Horses,” as the fidgety Briggs bobbed and weaved like a proud prize fighter on the First Ave stage in front of her two musicians. She proved to be a fiery and fierce vocalist. In other words, imagine an athletically built Adele as a live wire. Having just dropped her debut full length “Church of Scars” three weeks ago, the newcomer offered the unreleased “Baby,” the EDM-like “Dream” (cowritten with ex-Minnesotan and Adele collaborator Dan Wilson) and “Lyin’” (cowritten with Imagine Dragon’s Dan Reynolds, whose recorded voice was heard at First Ave). Briggs’ too-short 62-minute, no-covers set was exciting and encouraging. Can’t wait to see her when she has more material.